Couldn’t you use a little extra dough this holiday season? Whether for an unexpected expense or simply a YOLO moment, you’d probably welcome a few extra bucks in your pocket.. If so, you should check out the H&R Block Emerald Advance service. Emerald Advance can get you up to $1000 without having to jump through lots of hoops. People can apply today and receive their cash advance in time for the holidays. Whether you use Emerald Advance to cover holiday gifts or travel expenses to spend time with family over the holidays, people can feel good about relying on a financial expert they can trust all year – so they can do more celebrating and less worrying! Click here to apply today, and get ready for those Black Friday sales! 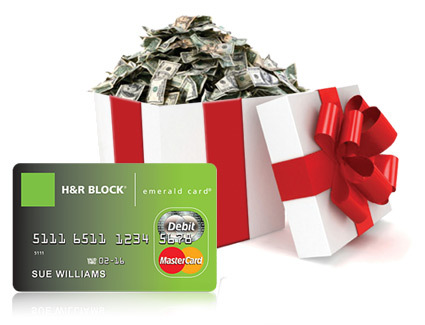 Now it’s your turn, as H&R Block is giving one lucky reader a $300 gift card! To enter the contest, simply e-mail us and tell us how you’d spend that $300. We’ll pick a winner at random on Monday, November 26th at 11:00am EST. The prize was provided and may be shipped to the winner by H&R Block, but H&R Block is not a sponsor, administrator, or involved in any other way with this giveaway. All opinions expressed in the post are my own and not those of H&R Block. Entrants must be 18 or older and located in the US only. Winner to be chosen at random. Win A Linkin Park / Medal Of Honor Warfighter Pack! I emailed.. crossing my fingers to win. I need some tires for my van.